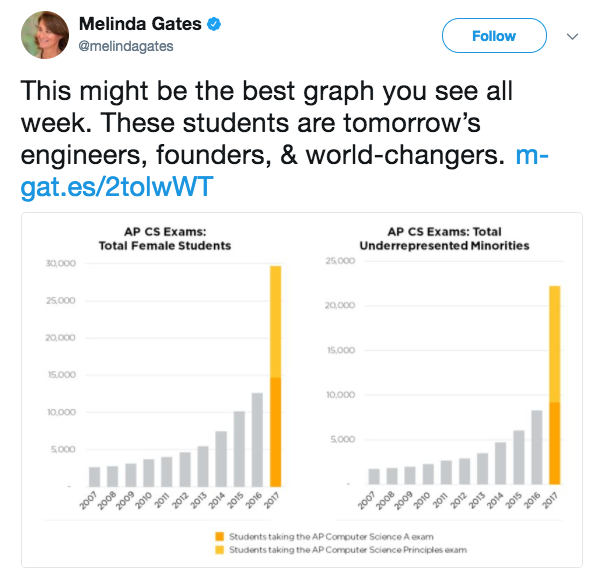 According to many excited retweets in my stream today, the number of females and “underrepresented” minorities taking AP Computer Science tests is way up. Like double up according to USA Today. Now, I don’t want to rain on anyone’s parade (although a little rain today might be nice :-), but I’m also bothered by the unquestioned acceptance of statistics in the form of dramatic bar charts. So let’s take a closer look at that chart. Notice that the bar to the far right combines two AP exams, the standard AP CS A exam, first offered in 1984, and the new AP CS Principles exam which was first administered in May of this year. If you remove that new program, there is still a growth in both females and “underrepresented” minorities1I assume they use that term because Asian students have long been overrepresented in AP CS classes in US high schools. in the CS A class, just not nearly as dramatic as reported in the headlines. Even so, a very positive sign. It’s also positive that so many students are enrolling in the Principles course, which is far more accessible to those who are not necessarily looking at CS as a career path. However, also missing from the analysis, both in the article and tweets pointing to it, is any information about how many of those new students actually did well on those AP exams. Five is the best score but three or four would also be respectable. We could discuss some value in earning a two. I call this the Jay Mathews syndrome: attributing all success to just taking an AP exam, regardless of any measure of actual learning demonstrated by it. Anyway, I mean absolutely no disparagement of the efforts to encourage more female and minority students to at least sample the study of computer science. And hopefully we’ll see this kind of steady increase when AP statistics are released next summer. But anytime someone reports huge statistical increases, or decreases, especially in anything dealing with education, be skeptical and take a closer look. The story is likely much more complicated than the graph out front.